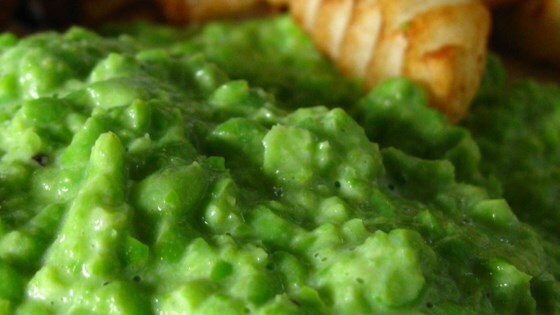 "Mushy Peas are a great side dish with fried cod or salmon. Note: You can add more liquid (water or cream) depending how mushy you want your peas. Use low fat milk if you're calorie-conscious." Best peas ever. I did not want mine so pureed, so I just used a hand held potato masher to mush them up with the butter, cream, salt, and pepper and they turned out GREAT!! I have made this recipe twice - once as is and the second time I substituted chicken stock for the heavy cream and added a teaspoon of wasabi powder. Loved both versions!